Okinawa is one of Japan's most popular travel destinations, and it's easy to see why—gorgeous beaches, delicious food and a unique culture. Not everyone can budget the time or money for a trip to those awesome islands, which is why you're in luck. Right in the heart of Tokyo is Okinawa Town, where you can get a little taste of island life! It might have been more accurate to call the area "Little Okinawa" instead of Okinawa Town, since it's a little small. While it might not stack up to the size of Yokohama's Chinatown, the small area packs a lot of Okinawan spirit! According to the Okinawa Town website, the emergence of Okinawa Town came about pretty organically. There was already a high proportion of Okinawan residents, including a famed scholar, and there were even quite a few Okinawa-style restaurants. So when a shopping street went out of use, it seemed like the perfect opportunity, so in 2005 it was decided that the area would be used to give Tokyoites a chance to experience a little bit of laid-back Okinawa for the first time. Okinawa Town holds events every few months, including festivals and karaoke tournaments, and has a variety of dedicated restaurants and shops. Once you walk through the Okinawa Town arch, you'll start to notice a lot of regional décor. 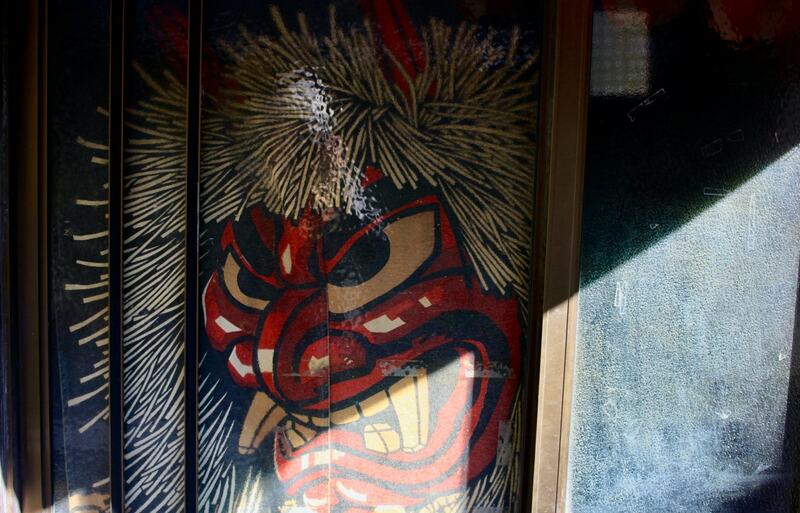 One of the most noticeable are the Shisa statues and red tiling above the entranceways. Shisa are a traditional cultural artifact ubiquitous in the Ryukyu Islands. These dog-lion guardians are variations of similar beasts found in Chinese traditions, and can often be found on or near these Okinawan style red-tiled roofs. These loveable Shisa statues always come as a pair. One has an open mouth, saying “Ah," thought to welcome good luck. The other has a closed mouth, saying “Un," to ward off bad luck. This harmonizing of "ah" and "un is called" Aun-no-Kokyu (阿吽の呼吸), which is an Okinawan concept similar to Yin and Yang. There were a number of these duos guarding entrances around Okinawa Town, including these lively ones outside of the Mensore Market Street. If you look closely, you're sure to spot several more! If you aren't familiar with Okinawan décor, it would be totally possible to walk through Okinawa Town without even realizing it. But once you step into the street that contains the Mensore Market, it suddenly feels like you're in a small backstreet in Okinawa, with lanterns adorning the entrances to restaurants and izakaya. It's worth noting that Mensore means “welcome” in Okinawa, and is a regional alternative to the typical irasshaimase or yokoso greetings you'll hear around Tokyo. 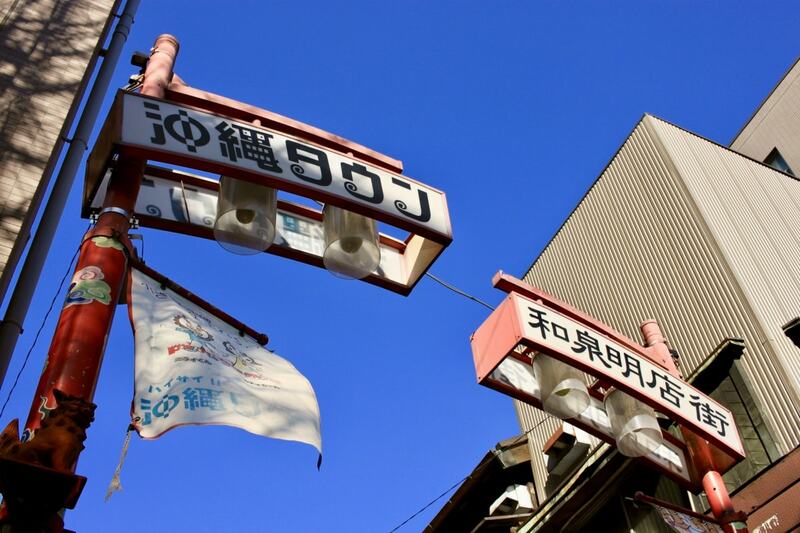 Here you can find a variety of establishments, such as Tinsagu Nu Hana, a lively izakaya with its sister shop Sabani next door. You can try out traditional Okinawan food such as umibudo ("sea grapes" that are a kind of algae very popular in southeast Asia) or doruten, a tempura dish containing pork, mushrooms, tuna and taro. A few doors down is Sekai no Ryuchan, a ramen restaurant offering a spicy “Black Magic" tantanmen. They are particularly proud of the fact that comedian Matsuko Deluxe has visited, displaying a photo with the celebrity outside their front door. There are a few other places to peruse in this area, including a tea shop and gallery, but one to look out for is the specialty sanshin shop, Toururunten. The sanshin is a traditional Okinawan stringed instrument, and Toururunten sources all of its items directly from Okinawa. The owner even offers a 20-minute lesson for those who want to learn how to play the sanshin! Outside of the market there are several more shops in keeping with the Okinawa theme. Right by the front archway is a liquor shop called Katagiri, selling over 40 types of Okinawan sake and awamori, which is made from rice but not brewed, like sake. For a taste of the tropical, they offer a shikuwasa (a Japanese citrus) liqueur and other fruity liqueurs. If you’re looking for a unique gift or party favor, this is the perfect place to go. Just a few steps from Katagiri is a small grocery store called Ijun, selling speciality food and snacks from the sunny south. While Ijun prides itself on its sales of the famed Blue Seal brand ice cream, and will even go as far as to deliver sets to your home, that's not all it has to offer. This shop also has a variety of goya-flavored items. Goya is a bitter gourd that is well known as Okinawa’s superfood, and it has been said that it can lower blood sugar levels and increase metabolism. If that piques your interest, Ijun sells a goya butaman (pork bun), goya tea, and even goya beer! They also have a selection of cute knick-knacks, such as small Shisha ornaments and ceramics. There are a few other shops in the area, such as the Takigami shoe store, which sells some traditional “island shoes," so make sure you do some exploring. But, if you really want a taste of Okinawa, let’s have a look at what the restaurants have to offer. Even if you just stop for a few drinks, make sure you try at least one dish at Yanbaru. The food is a fusion of western and Japanese, but don’t let the word “fusion” drive you away. They truly take the best of western food and the best of Okinawan food to offer a mouth-watering menu. The rice croquettes (arancini) were so good we ordered them twice! Yanbaru refers to the given name of the northern part of Okinawa, where the land is still mostly dominated by nature, like subtropical rainforests. It is also the name of an Okinawan bird, the yanbarukuina, whose likeness we found hanging from Yanbaru’s house sake. The atmosphere is very cozy, and of course they offer an array of Okinawan drinks to accompany their dishes, such as their Okinawa Ginger highball, shikuwasa liqueur and the classic Orion beer. Overall it is worth a visit to Okinawa Town simply to go to Yanbaru. Our second favorite is Shima no Ren. Shima no Ren offers a livelier atmosphere, and is more like a traditional izakaya than Yanbaru. They offer more traditional Okinawan dishes such as goya chanpuru and taco rice, alongside your choice of the area’s alcohol. Do you remember what goya is? Goya chanpuru is a stir fry of goya, egg and a selection of meat and vegetables, an incredibly tasty way to get your superfood of the day. Taco rice is as simple as it sounds—rice with taco-style mincemeat and spices, a staple dish from Okinawa. This is certainly the place to go if you want to get a taste of some authentic Okinawan food. Their décor is great too, they even have their own set of Shisa! Of course, there isn’t a lack of restaurants to try around the area, including some of the non-Okinawan variety, but if you only visit Okinawa Town once, these are not to be missed! I’m a current eikaiwa (English conversation) teacher who loves to travel. When I get some of that coveted time off, I like to explore as much of Japan as possible! In my free time I take photos, do digital art, and practice my kanji through the art of Japanese calligraphy.